When is Once Upon a Time‘s Mulan going to catch a freakin’ break? After a lot of teases from the creators about an LGBT relationship happening in Season 5 of Once Upon a Time, it finally happened — although it’s not the one most fans wanted or expected. 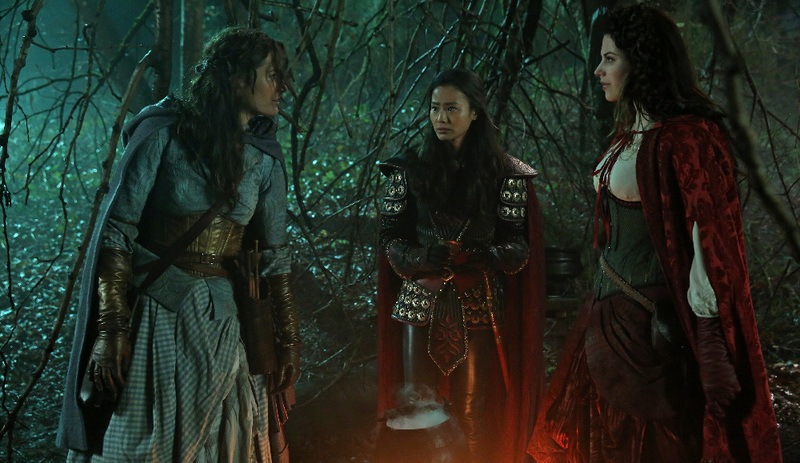 Last Sunday’s episode brought Ruby back into the picture, which ended up bringing both Mulan and Dorothy into the storyline during this Sunday’s episode. Obviously, fans assumed Mulan and Ruby (aka “Mulan Rouge”) would eventually happen and find their happy endings with one another. Surprise! That’s definitely not the case, because as of right now, Dorothy and Ruby are a thing. That’s right: Dorothy and Ruby are in love. Firstly, let me just say that I’m happy they are happy. Secondly, I’m thrilled that an LGBT relationship is finally happening on OUAT, because it is long overdue. However, it’s kind of disappointing to see Mulan left on her own once again. Seriously, when is she going to catch a break in the love department? It’s about time she’s found her happy ending, too. After moving on from Aurora, I’m pretty sure I can speak for all OUAT fans and say that we all thought she would end up with Ruby, right? Of course, Mulan rooted for Ruby and Dorothy, because she’s become close with Ruby and wants her friend to be happy. After Ruby said to Mulan about realizing her feelings for Dorothy, “I think that I’ve been looking for someone like her. I know we just met, but I’ve never felt like this about anyone before,” Mulan couldn’t have been more excited for her and even pushed her to follow her heart, unlike she herself did when it came to Aurora. It’s kind of heartbreaking to see Mulan’s happiness for Ruby and Dorothy, especially when most viewers thought Mulan Rouge would happen sooner rather than later. Granted, I dig Dorothy and think she’s a badass, just like Mulan and Ruby. So, if Ruby and Dorothy need to happen in order for Mulan and Aurora to end up together, then I’ll feel better about all of this. Clearly, Dorothy and Ruby are meant to be. I mean, Ruby’s kiss did wake up Dorothy from Zelena’s sleeping curse. There’s no getting around true love’s kiss. Whatever the case, I’m all for love and happiness on OUAT no matter who it’s between. Let’s just hope Mulan will find it, stat.